ENSO – What is it? What Is a “La Niña Ready Nation”? Follow instructions of emergency personnel as to when it is safe to return. Take pictures of the damage before beginning clean up. Keep records. List all clean-up and repair bills, flood-related living expenses and actual losses, such as furniture, appliances, clothing, etc. Be sure utilities are disconnected before entering the building for the first time. Disconnect main switch and all circuits. If the main switch is located in the basement, be sure all flood water is pumped out BEFORE attempting any work on electrical systems. This work is best done by an electrician. Have an electrician check for unsafe conditions and equipment before reconnecting systems. 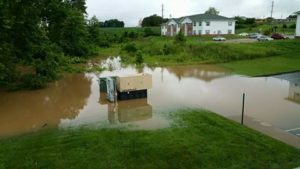 Equipment and wiring that appears to be safe soon after flooding may fail prematurely and cause a fire or shock hazard. Replacement is often the best option. Circuit breakers that have been under water should be replaced. Mold is common after the flood. Your home should be washed to prevent health problems. In most cases household cleaning products will do the job. Read the label to see how much to use. Tackle one room at a time. The two-bucket approach is best. One bucket for cleaner, one for rinse. Plywood subfloors may separate when flooded. Sections that separate must be replaced to keep floor from warping. When floor coverings (carpets, rugs, etc.) are removed, allow subflooring to dry (it may take several months) before installing new flooring. Remove water from structure as rapidly as possible. Remove interior surface of insulated walls to point above water height. Remove and discard wet insulation. Treat interior wall studs and plates with disinfectant to prevent growth of decay-causing organisms. Provide ventilation by opening windows and doors and using fans. Leave walls open for up to four weeks or until they have thoroughly dried. Select replacement materials that will withstand future floods. Delay permanent repairs until buildings are thoroughly dry (may be several weeks). Control mildew in the weeks and months that follow flood. Even if your washing machine did not get wet, do not use it until you know that the water is safe enough to drink and that your sewer line works. Before you wash clothes in the washing machine, run the machine through one full cycle. Be sure to use hot water and a disinfectant or sanitizer. Take clothes and linens outdoors and shake out dried mud or dirt before you wash them. To prevent a drain clog, hose off muddy items to remove all dirt before you put them in the washer. Check the labels on clothes and linens, and wash them in detergent and warm water if possible. Adding chlorine bleach to the wash cycle will remove most mildew and will sanitize the clothing, but bleach fades some fabrics and damages other fabrics. You can buy other sanitizers, such as pine oil cleaners, at the grocery store to sanitize fabrics that cannot be bleached. If the label says “Dry Clean Only,” shake out loose dirt and take the item to a professional cleaner. Furs and leather items are usually worth the cost of professional cleaning. If you want to clean leather yourself, wash the mud off and dry the leather slowly away from heat or sunlight. if you use them correctly. Check the label on the products to see how much to use. Some products shouldn’t be used on certain materials; the label will tell you that. Apply cleaner and give it time to work before you mop or sponge it up. Follow directions and all safety precautions on the container. After cleaning a room or item, go over it again with a disinfectant to kill the germs and smell left by the floodwaters. You may also need to get rid of mildew, an unwelcome companion to moisture that shows as fuzzy splotches. Tackle one room at a time. A two bucket approach is most efficient: use one bucket for rinse water and the other for the cleaner. Rinse out your sponge, mop, or cleaning cloth in the rinse bucket. Wring it as dry as possible and keep it rolled up tight as you put it in the cleaner bucket. Let it unroll to absorb the cleaner. Using two buckets keeps most of the dirty rinse water out of your cleaning solution. Replace the rinse water frequently. Start cleaning a wall at the bottom or where the worst damage was. If you did not have to remove the wallboard or plaster, you may find it the wallboard or plaster won’t come clean and you will want to replace it rather than clean it. If you have removed the wallboard or plaster, wash the studs and sills and disinfect them. Solid wood furniture can usually be repaired and cleaned, but wood veneer often separates and warps. Wood alcohol or turpentine applied with a cotton ball may remove white mildew spots on wood. Cream wood restorers with lanolin will help restore good wooden furniture parts. Upholstered furniture soaks up contaminants from floodwaters and should be cleaned only by a professional. Unless the piece is an antique or especially valuable, upholstered furniture soaked by floodwaters should probably be thrown out. Carefully remove a board every few feet to reduce buckling caused by swelling. Clean and dry floor (it may take several weeks or months) before replacing boards and attempting repairs. If subfloor is wood, tile or sheet vinyl, it should be removed so wood can be replaced. If floor has not been soaked, loose tiles may be re-cemented after floor is dry. If subfloor is concrete, removing tile or sheet vinyl will speed drying of the concrete floor. If the tile or sheet vinyl is not damaged, you may allow the floor to dry on its own. If water has gotten under loose areas of the sheet flooring, remove the entire sheet. Pull up water-logged carpets. Discard all padding. Rugs and pads should be dried outside on a clean, flat surface, such as a concrete driveway. Place face down so stains will wick to the back instead of to the face yarns. Hose off and, if badly soiled, add detergent. Work detergent into carpet with broom and rinse well. Remove as much water as possible quickly using steam, fans or water-extraction equipment. Take care to avoid electrical shock. To prevent mildew and odors, rinse with a solution of two tablespoons of chlorine bleach per gallon of water. Dry carpet and floor thoroughly before carpet is replaced. If carpet is put down wet, it may mildew. Carpet and backing may shrink. Take furniture outdoors to clean. Hose or brush off mud. All parts (drawers, doors, etc.) should be removed. Dry slowly out of direct sunlight (hot sunlight will warp furniture). It may take several weeks to fully dry. Appliances that have been under water must be cleaned and dried before starting. All electricity or gas must be turned off. Open as much as possible to rinse or wipe clean. Let dry. Three days to a week is necessary for drying. Wash (hands, feet, etc.) frequently in purified or disinfected water. Wear rubber gloves for extra protection against contamination. If you have cuts or scratches on your skin you must wear rubber gloves. As flood waters go down, use a disinfectant to clean walls and woodwork. A garden sprayer works well, spraying from top to bottom. Scrub with a brush to help remove mud and silt. Rinse with clean water and dry. If electricity is on, use heater, fan or air conditioner to speed drying. Remove water from home/business as soon as possible. Remove inside of walls to point above water height. Treat interior wall studs and plates with household bleach solution to prevent mold. Open windows and doors and use fans to allow to dry. Leave walls open for four weeks or until they have dried. Even if your washing machine did not get wet, do not use it until you know that the water is safe enough to drink and that your sewer line works. Before you wash clothes in the washing machine, run the machine through one full cycle, using hot water and a laundry detergent with one cup of bleach. Take clothes and linens outdoors and shake out dried mud or dirt before you wash them. 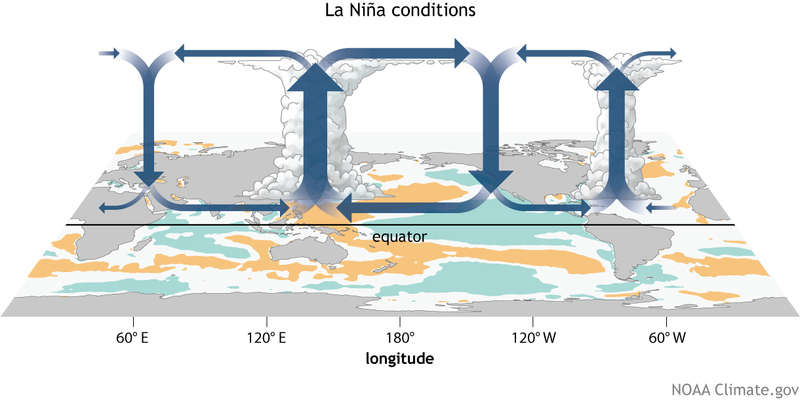 It looks like we’re in for another La Niña winter. What does that mean? Victims are the true first responders (e.g. “zero-order responders,” ZORs) when a disaster occurs, because they fend for themselves before outside help appears on the disaster scene. From CCB Report: “Working with a changing Climate, Not Against It” (Full Report).